You are here: Home / Recipes / Dessert / Easy Buttery Kahlua Fudge! I love it when my friend Susan shares a recipe with us. She’s back today with a recipe you won’t be able to resist! 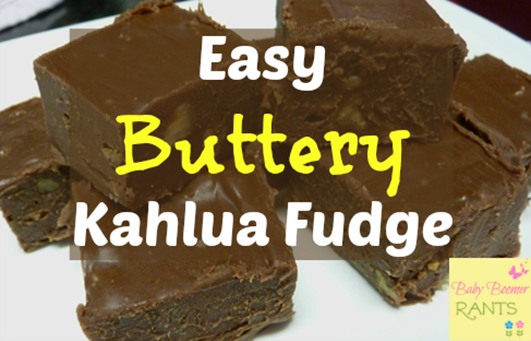 Easy Buttery Kahlua Fudge! I decided I wanted something sweet and made some fudge. I couldn’t resist. Years ago, I tasted a Kahlua Fudge and decided to try adding it to an easy and common recipe. Here it is…. Place foil in a square baker and spray with Pam. Melt the butter and chips in a sauce pan. Add the sweetened condensed milk and stir while still simmering. Add the Kahlua and pecans. Stir until smooth and then pour into square baker. Put in the refrigerator until hardened. Slice pieces really small because it is rich.